Our full-service horticultural care includes the design, installation and regular maintenance of your plants, including watering, cleaning, trimming, fertilizing and disease/pest control. Each member of our Horticultural Team is fully trained, uniformed and courteous. Because the health and safety of our employees and your staff are of paramount concern, we use organic methods to maintain your plants. By working closely with the top growers and manufacturers throughout our industry, we will meet your needs and exceed your expectations. 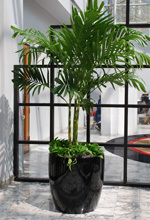 Interior Plantscapes offers an extensive variety of plants and containers from which to choose for both your interior and exterior landscape designs. Generally categorized based on the amount of light needed. Call our design consultants to help you select the perfect plants: Low Light, Medium Light, High Light, Flowering Plants. From high profile ceramics and metals, to affordable fiberglass and plastics, we offer a variety of options. Call our design consultants to help select the perfect containers: Metal, Ceramic, Fiberglass, Plastic, Exterior. Selecting the right plant for your environment is essential for the long-term success and beauty of your interior landscape. From years of horticultural experience, we understand the varying requirements for lighting, temperature, and traffic patterns that affect plants. With a vast array of acclimatized plants and stunning containers, our professionals will match our creative ideas with your budget, to ensure your space maintains an "atmosphere of success." Click here to contact us for a free design consultation. We offer professional interior plant maintenance services to assure that your plants look their best, even years after installation. Whether you choose to lease or purchase your plants and containers, we will customize a guaranteed maintenance program designed to meet your needs. Under the maintenance plan, a uniformed member of our Horticultural team will visit your space regularly to provide total plant care: watering, feeding, dusting, trimming, insect control and replacement. With our 100% replacement guarantee, you can feel secure knowing you will always have the perfect look for your environment. Nothing brightens up a workspace like bold, exciting colorful plants! By incorporating daring colors and textures, we can help you energize your interior space. 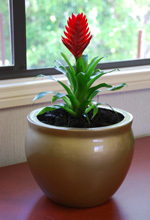 The addition of exotic orchids, colorful bromeliads and unique foliage material make a powerful statement and bring color and vitality to any office. We offer special rotation options of different colors and varieties, depending on individual clients' needs. Click here to contact us about our color rotation programs.